Ag Leader offers three SMS package options. SMS Basic is designed to help make bottom line improvements to any operation. Step-by-step software wizards and a common-sense interface make setup and using the software easy. SMS Basic works with Ag Leader’s precision farming hardware, but offers compatibility with other hardware as well. Managing information for multiple operations and clients is easy using SMS Advanced. In addition to powerful analysis tools, SMS Advanced serves as the data warehouse for those who provide precision farming information services to multiple grower clients. SMS Advanced simply allows consultants or farm managers to spend less time crunching numbers and more time analyzing information. Take the power of SMS with you to the field! 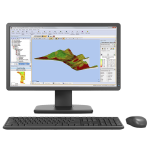 Use this powerful program for soil sampling, crop scouting, management-zone creation, making point/line/area features, and more! SMS Mobile is compatible with Microsoft Windows Mobile platforms, as well as Windows XP to version 8. Our yields have increased dramatically - 30 percent in some areas. By applying the needed nutrients to the low testing areas of the field, it has raised the yield in those spots by 35 to 45 bushels/acre, which has helped our overall field average immensely. When you muliply that increase by $6, that is a good return.